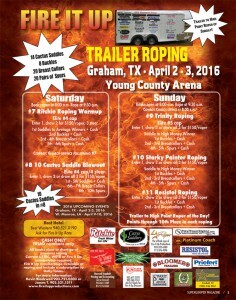 Fire It Up Trailer Roping come to the Young County Arena on April 2 and April 3, 2016. Up for grabs in this event are 14 Cactus Saddles, 8 Buckles, 20 Breast Collars and 20 Pairs of Spurs. If you’ve never seen a trailer roping event, this is a great opportunity right here in Graham. Trailer to High Point Roper of the day! Points through 10th place in each roping. This entry was posted on Friday, March 18th, 2016 at 12:56 pm	and is filed under Events, News & Updates. You can follow any responses to this entry through the RSS 2.0 feed. Both comments and pings are currently closed.